Caution: do not touch dry ice with bare hands, you will get a cold burn! It surely is shaping up to be a hot summer! With the 85 to 90 degree weather, consumption of my homemade lemonade is almost greater than the production capacity. That is kinda what motivated me to do a “cold” dish! When I think of cooling, I think cold liquids like liquid nitrogen or even liquid helium, which are impractical for a home kitchen. Fortunately, there is a home friendly alternative- dry ice. The miraculous solid state of the infamous green house gas CO2- this sucker is as cold as -78.5C or 109F. Just how cold it is? The south pole of mother earth is hardly colder than that! You touch it, you will get cold burn, instantly! When exposed to room temperature, it sublimes into cold gas which cools down the ambient air enough the moisture in air becomes fog. This process surely cools down anything around it, but it also has the advantage of carrying with it the aroma from ingredients that are in close vicinity. 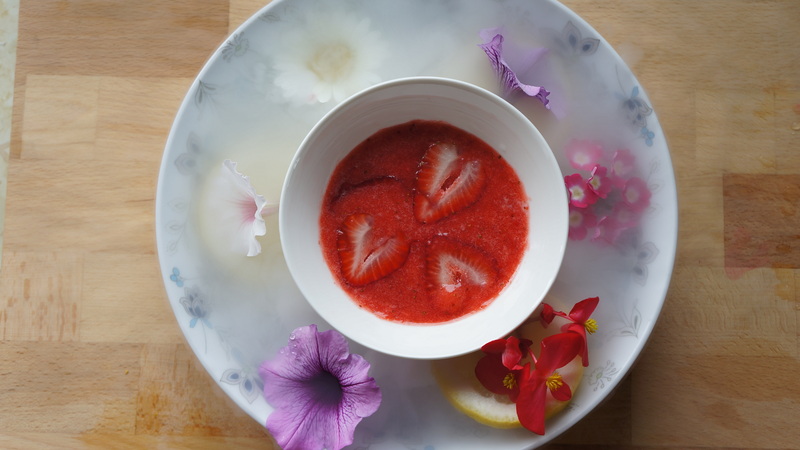 For this cold soup recipe, I pretty much closely followed the strawberry soup recipe by Gray Kunz, but added my own touch of CO2 cooling and aroma diffusing effects, plus the lush summer flowers which are meant to add to the presentation instead of consumption. The ingredients focus on summer flavors such as strawberries, lemon, honey, with the crisp taste of champagne. 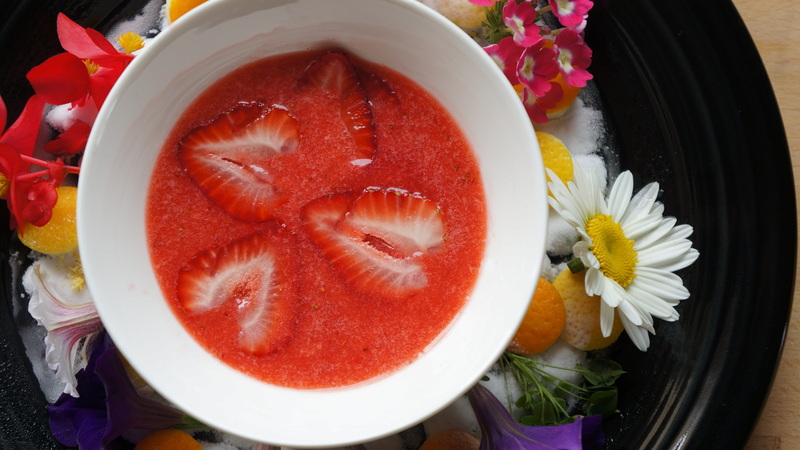 3 cups of strawberries, 3 and 1/3 cup champagne, 1/3 cup + 6 table spoon of sugar, 1/2 fresh orange juice, fresh juice of 2 lemons, 1/3 cup orange blossom honey, lemon peel and zest, orange peel and zest. Assorted summer flowers for presentation. Pulse the champagne ice and soup after freezing and chilling. 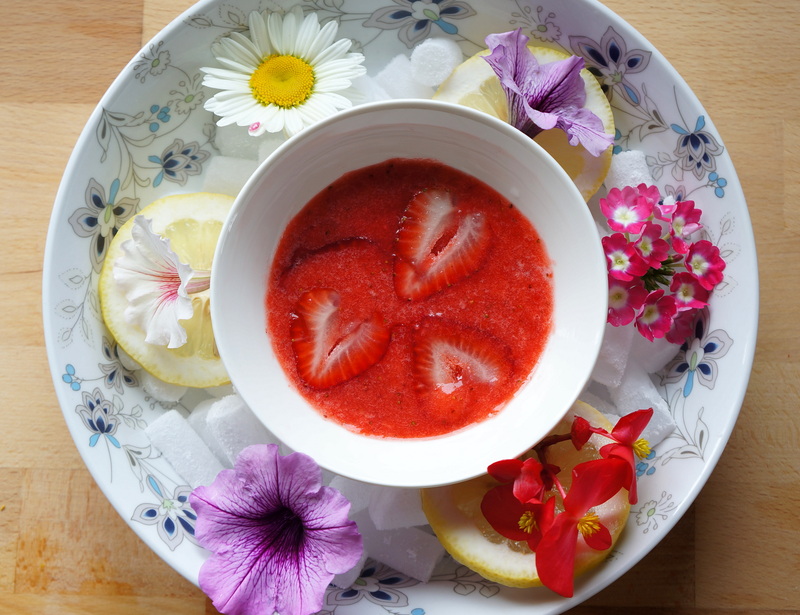 To serve: scoop some soup into a bowl, top with a few thinly sliced strawberry. 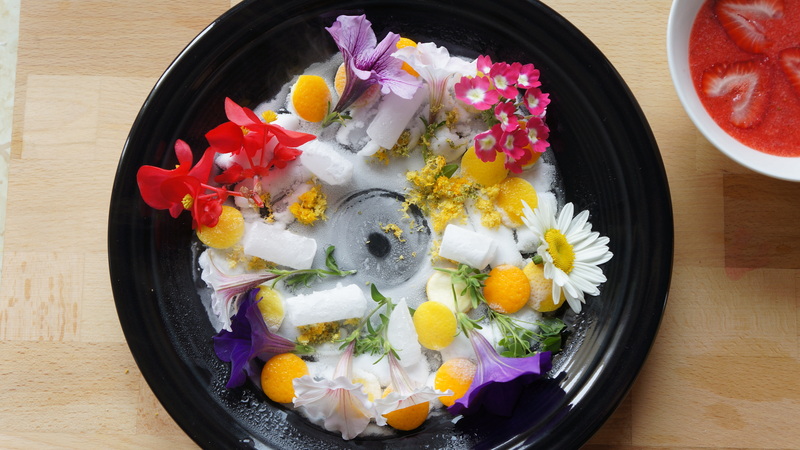 Arrange dry ice pallets on a plate, arrange lemon and orange peels and zest around the dry ice, arrange flowers around. Place the bowl of soup in the middle, pour some water around the bowl to ignite the aromatic fog. You can also play around using different plates and different arrangements! I was really intrigued by this recipe so had to have a look and see what it was all about. Looks lovely and refreshing!